I was supposed show you more new items from our New Bathroom Decor Collections, and in a way I will still be doing that, but I did want to show you first what we have available for Mother's Day, and at the same time, I will also show you a few more of our new Decor Items! We used some of our new Bathroom Decor Accents to create some special Mother's Day Gift Sets and we are offering them to you at special Mother's Day prices! We had a great time putting these sets together, and I hope you can see how nice some of our new items work together and how nice they look as bathroom accents. All of the items you will see in the following sets can also be purchased separately. Our first gift idea is the Porcelain Bathtub Soap Dish & Handcrafted Round Soap Mother's Day Gift Set. This new Bathtub Soap Dish is just the perfect gift idea for anyone who is a Bath Lover like I am. I fell in love with our new White Porcelain Bathtub Soap Dish because it is so darn cute in person, and if I could, I would own a bathtub just like it! And as you can see our new Round Decorative Soap fits perfectly in the Soap Dish and with just a simple ribbon bow, this gift just looks downright a-d-o-r-a-b-l-e! What bath lover would not LOVE it! Our next gift idea is the Vintage Style Small Glass Canister & Handcrafted Round Soap Mother's Day Gift Set, which would be ideal for someone who loves pretty dainty things, but really needs or wants items that are a little more sturdy. Although it looks very dainty and fragile, our new Vintage Style Canisters are actually made with fairly sturdy glass. They have a scalloped or fluted like pattern on both the lid and the sides and have a nice large hollow knob on the slightly domed lid. This is an incredibly easy gift set to put together for anyone anytime of the year, but fyi - the round shaped soaps are the only soaps that fit in it. The Handcrafted Round Soaps are available in Rose (shown), Lavender and Olive Blossom. Our next gift idea is perfect for someone in need of a larger bath accent! Our Vintage Style Large Glass Canister & Sponge Mother's Day Gift Set is made with our largest new Glass Canister filled with our new 3 pc Caribbean Grass Sponge Set. The grass sponges are so pretty and delicate looking, and our new 3 pc Set is just the right size to fill the large canister, which is just over 12" tall! Like the small Vintage Canister, it has scalloped glass details and made with sturdy glass. With it's large size, this canister would hold a number of different decorative items as well. Our next gift idea is perfect for the lady who just loves dainty delicate items and has the room, lifestyle and space for them. Our Cottage Style Large Glass Canister & Handcrafted Square Soap Mother's Day Gift Set is just stunning in person, with an almost ethereal look to it. Our Large Cottage Style Glass Canister is our most delicate glass canister style. The new Cottage Style Canister has a scalloped pattern similar to the Vintage Style, but overall it is smaller and the glass much thinner. It has a very dainty and detailed look and style, that would be just perfect in a feminine style room. And fyi - our new Square Handcrafted Soap fits in the Large Cottage Canister perfectly. If you look closely, you can see that the square soap is in a taller box as well, and it has a small embossed ceramic tag hanging by a ribbon - so so cute - and even by itself, the square soap is a charming gift idea! Our last gift idea and also our biggest is our 6 pc Vintage Style Canister Set Mother's Day Gift Set. As you can see it is the Large and Small Vintage Style Canisters and their contents together in one BIG Mother's Day Gift Set! This would be perfect for someone that just recently moved into their first home or that is redecorating a bathroom or someone with a bathroom area in need of some stylish bath decor. Together these canisters can fill any bare area quickly and look great doing it. And since they both come filled to perfection, they are ready to add great style to any bathroom the moment that they are unpacked! Besides looking great together, the best part is this set is under $50! It is pretty, practical and a great value, and what Mother doesn't love that combination! I hope you enjoyed seeing our new Mother's Day Gift Sets and some more of our new Bathroom Decor items. 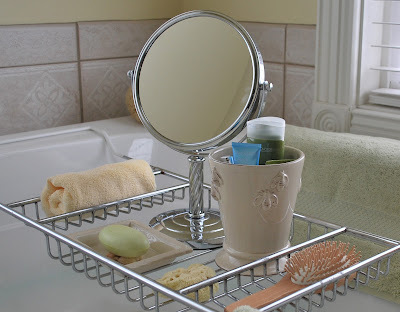 All of items in the sets are available separately in our Bathroom Accessories & Decor > Bathroom Decor Accents Categories. These gift sets can also give you some ideas and examples of some of the new items that work well together and are great gift ideas for any time of the year, or even great decor accents for your own home. I know it's been awhile and I apologize for my tardiness in posting! I have been so busy getting our Abbott Home & Bath Accent Collections listed in the store and unpacked and that has taken every free moment I had. Today is my (and yours) First Look at two of the collections from the Country Chic & Cottage Decor category. There are two large Country/Cottage Style Room Accessories Collections from Abbott, the Bee Motif Collection and the Dragonfly Motif Collection. The Bee Motif Collection is a cream colored glazed ceramic and the cream color is on the "warm side". After trying a number of our towel colors with it I thought it looked the most fabulous with our warmer colors (i.e. Elegance Sunshine & Thyme) Here are some of the Bee Motif Collection items - the Soap Dish and Taper Vase on our Jumbo Bathtub Caddy. I use a canister or cache pot for my toiletries, so I used the Taper Vase for them for the photo to see how it worked. Of course you could use the Taper Vase for flowers or plants as well - it holds one standard 4" growers pots. The Mirror is our Jerdon 5x Vanity Mirror in Chrome and the Bath Towels are the Sunshine and Thyme from the Elegance Collection. Those colors looked so springtime fresh - especially with the flowers below that I grabbed from our living room for the photos! 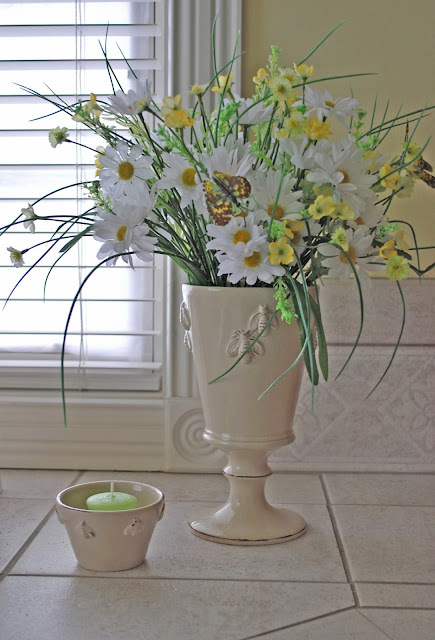 The Bee Motif Pedestal Vase below would be a nice focal piece if you have a nice large space for it in a room. It would give height to any area, especially if you add the taller silk flowers. It certainly doesn't need much with it to fill up any large corner or counter area! I paired it with the Bee Motif Votive Cup and that was really all that it needed for the large tile corner space by our tub. A bird's eye view of some of the Bee Motif items together so you can get an ideas of their proportions in the room and to each other. I did not expect the cream collection to look as nice as it did in our bathroom because everything is already mostly cream colored, but by adding more color with the flowers and the towels they actually looked amazing! The Dragonfly Motif Collection is a gorgeous Turquoise or "Celadon" glazed ceramic and the color was amazing in our bathroom. Our valances have a similar color and the Turquoise just popped on the cream tiles. With also have pale yellow walls and the color was just perfect with them as well. Unfortunately the light was fading and these photos do not do them justice. I paired them with our Belaire Collection in Crystal Blue and White, the Crystal Blue is almost a perfect match, and both the Pristine (Cream) and White Towels looked equally nice as a contrast to the Turquoise. Below is the Dragonfly Motif Cache Pot and Soap Dish on the Jumbo Caddy. I thought it would be nice for you to see the difference between the Taper Vase above and this Cache Pot below. I always use a ceramic canister on my caddy to hold my skin care products and the Cache Pot held them all and then some. It is quite a bit wider than the taper vase and it also holds a standard 6" growers pot in it. In this photo especially you can see the quality of the Celadon glaze and how deep the shine is. It almost looks like a mirror on the Cache Pot, and I was not using a flash! Below is the Dragonfly Motif Rectangular Planter which works beautifully on the counter with towels or on the tank-top with toilet paper. It would also be a nice storage box for curling irons and blow dryers as it is very resistant to heat. And of course it would be beautiful with live plants or flowers! It holds two 6" standard size growers pots. It is also available in the cream Bee Motif Collection. Lastly is a panoramic view of some of the Dragonfly Motif Collection including the tumbler, which I did not show with the Bee Motif (but is available). On the counter I had the Rectangular Planter holding the White Belaire Hand Towels. You can again see the beautiful shine in these photos and the deep rich Celadon glaze. I have to say - they look even better in person! Next week I will highlight our next Abbott Collection, Glass Decor & Storage. I can hardly wait to play with them and show you what they can do! That category includes Glass Storage Canisters, Glass Candle Holders and Hurricanes! I opened a few yesterday and they are realllllly nice! There are a total of SIX NEW Abbott Decor Accents Categories in our store. They include Country & Cottage Decor (including the Bee & Dragonfly Motif Collections from today) Glass Decor & Storage, Coastal Decor, Parisian Inspired Accents, Soap Dishes & Soaps and Wall Hooks & Signs. I am so excited to be able get them all out and "play" with them and show you what they look like. I hope you enjoyed our First Look at the some of the items from the Country Chic & Cottage Decor category. Please excuse my photo quality, I wanted to get these up today and took them rather quickly! They have some wonderful decor accents for your bathroom or really any room in your home. Visit our store to see them all now and more! See you here next week with more NEW items from Abbott!